The Red/White Saturn Ring MKII is a general purpose, recessed, water resistant, red/white fixture with the added benefit of high-power LED technology. 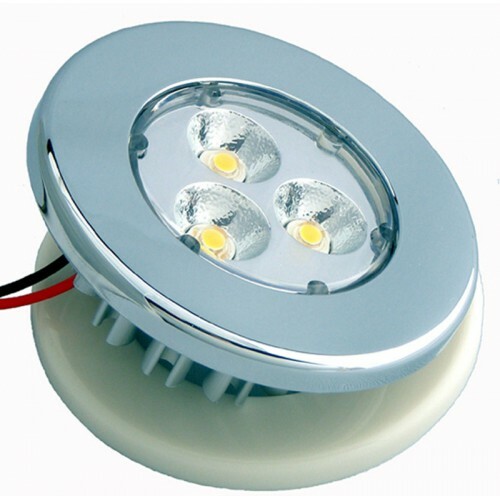 This light produces warm white or red light and is fabricated from the highest quality components to assure long life and trouble-free service. It's patented internal circuitry provides consistent brightness and makes it immune to life-shortening voltage fluctuations. It's incredibly low power draw (0.3 A) makes it the perfect way to reduce energy consumption.  Internal circuitry provides for constant current draw, regardless of voltage fluctuations from the source, meaning no flickering and longer LED life.  Long service life, shockproof, ultra-rugged with no filament to burn out or break.  Very low power consumption (approximately 3.6 W – 0.3 A). 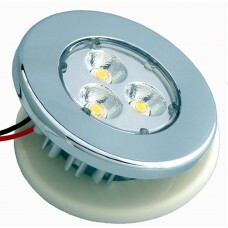  Lead and mercury free, no UV output.  White and chrome colored trim rings included; brass colored (gold plated) trim ring sold separately.  3" (76.2mm) overall diameter; requires a 2" dia. (50.8mm) cut-out, 0.8" (20.3mm) deep.